Like nearby Willow Springs Lake, the Department built Woods Canyon Lake for aquatic recreation. Other similarities include easy access, proximity to Phoenix and excellent visitor facilities. It’s a beautiful, canyon bound, deep lake, with plenty of trout fishing opportunities. Woods Canyon Lake has produced a couple winners of the Department’s “Big Fish-of-the-Year” Program in the brown and rainbow trout categories, including a 10-lb. brown trout in 1999. 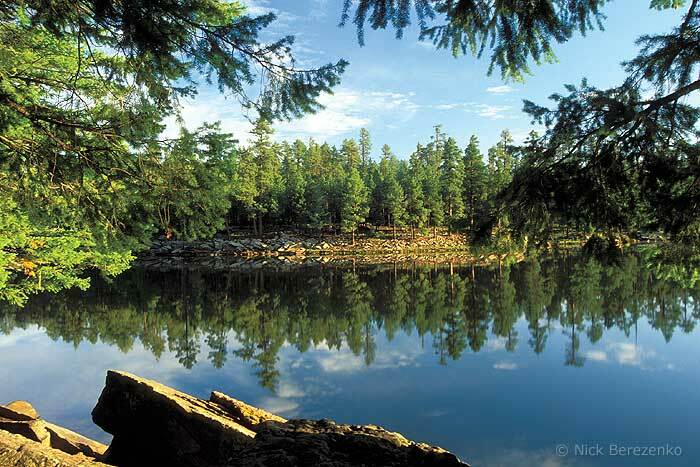 Location – Woods Canyon Lake is located close the edge of the Mogollon Rim, approximately 30 miles east of Payson on the Apache-Sitgreaves National Forests. To get to this scenic Rim lake from Highway 260, drive west about 4 miles on paved Forest Road 300 (the Rim Road), then turn north onto paved Forest Road 105 and proceed about a mile to the lake. Access is restricted in the winter when roads are closed at the highway due to snow, generally December to early April. Description – Woods Canyon Lake consists of 55 surface acres, with an average depth of 25 feet and a maximum depth of 40 feet. It lies at 7,510 feet. Because it is deep, the lake maintains good water quality, and is stocked weekly, from May through September, with catchable rainbow trout. A few, large brown trout remain in the lake from stockings years ago.. Amenities –Visitors to Woods Canyon Lake can enjoy a picnic area with restrooms and a boat ramp. There is also a concessionaire who rents boats, sells fishing licenses, bait and tackle, and operates a well-stocked country store. There is a dump station about a mile from the lake. Campers can stay at one of four fee-use campgrounds. Spillway Campground has 26 sites, each accommodating a trailer up to 16 feet long. It fills quickly on weekends, owing to its proximity to the lake. Amenities here include barrier-free restrooms, drinking water, picnic tables, fire rings and a campground host. Aspen Campground, along Forest Road 105, is much larger with 136 sites, and can accommodate trailers up to 32 feet long. It has the same amenities as at Spillway. The Crook Campground is mainly a group camping area, with two loops and a total of 26 sites. Usually, one entire loop is reserved for a group. Each loop has a large ramada with picnic tables. Finally, Mogollon Campground, located along Forest Road 300, has 26 units accommodating trailers up to 32 feet. Amenities are the same as at Spillway Campground. No reservations are taken for this campground. Camping fees at most of the campgrounds start at $16 per vehicle per night. The campgrounds are open from April 15 to October 15, weather permitting. Get more camping information and reserve a site by visiting www.reserveusa.com or by calling 1-877-444-6777. Fishing Techniques – If fishing for rainbow trout from shore, try Power Bait or worms. Boaters can try trolling a Super Duper or tiny gold Kastmaster lures. When it’s hot in the summer, fish a little deeper, between 10 and 20 feet; but don’t fish too deep, because the lake stratifies in the summer, meaning there’s no oxygen at the bottom. The lake is loaded with crayfish; try fishing for big browns in spring and fall with spinners or lures that imitate crayfish patterns. Special Notes – Statewide fishing regulations apply and a trout stamp is required. The daily bag limit is six trout; three for unlicensed anglers under the age of 14. Boat motors are restricted to electric motors only.